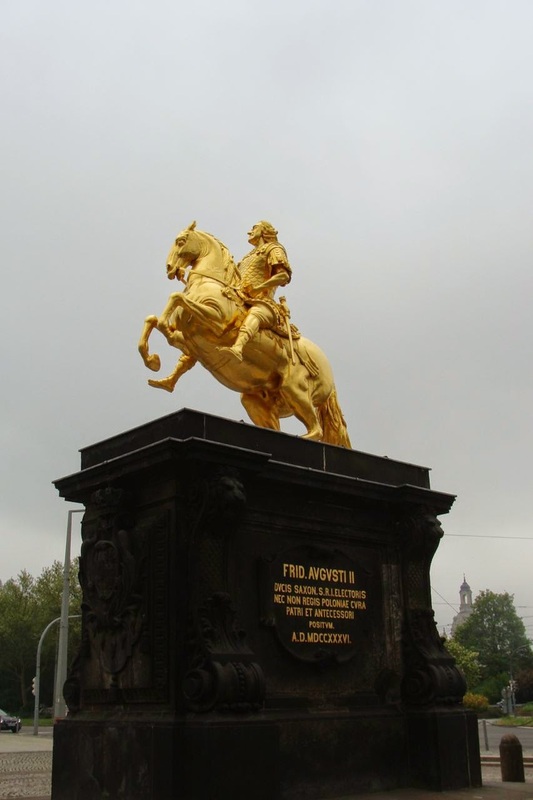 We cross over the Elbe on the Augustusbrücke, which takes us past the Blockhaus and the “Goldener Reiter” a gilded equestrian statue of August the Strong smiling in the face of a grand boulevard, the showcase of local socialism. It is a wide boulevard with a center pedestrian path that separates two lanes of traffic. 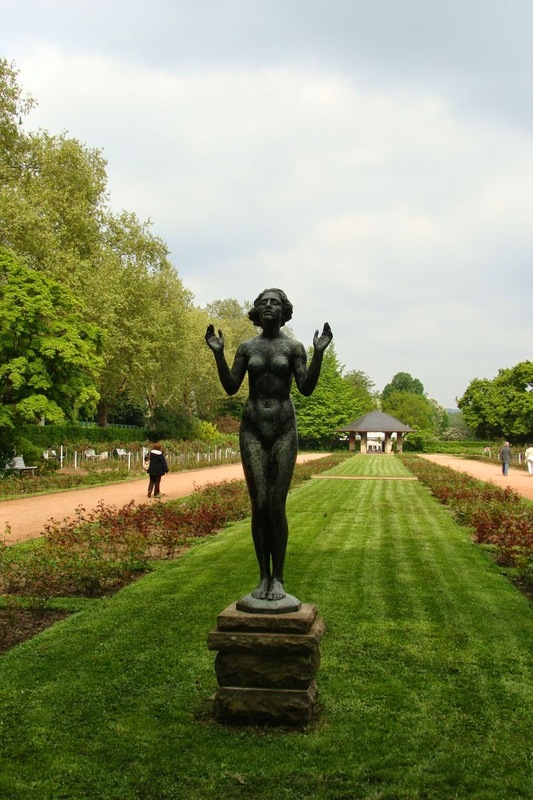 There are a lot of sycamore trees, and some statuary. On either side are a series of long low-rise (four stories) apartments sitting atop retail. It’s a nice arrangement, but they are in bad repair. Our goal is to find Dreikönigenkirche, and soon find it. What has happened here is very interesting. Having to rebuild the church after the firestorm, the congregation shortened the church itself (and by that I mean the nave of the church) so as to accommodate a parish hall, community rooms and offices, and other social amenities. It works well. There is still a large worship space, and from what we could tell, ample outreach into the community. Again, the name of the church bears little semblance the iconographic program of the church. 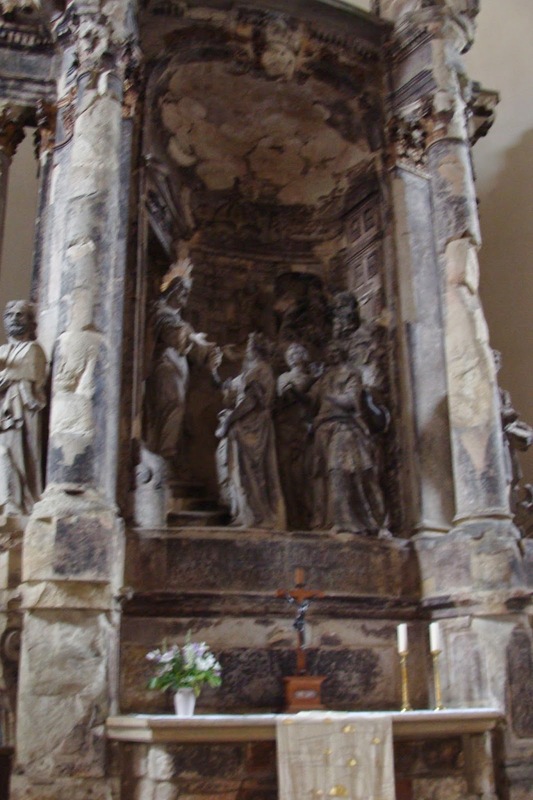 The large altarpiece of the church which one would think would be devoted to the visit of the Three Kings (this would have required a representation of the Blessed Virgin Mary) is instead devoted to the Story of the Wise Virgins. One wonders. Was this to avoid the BVM or was there some other reason. 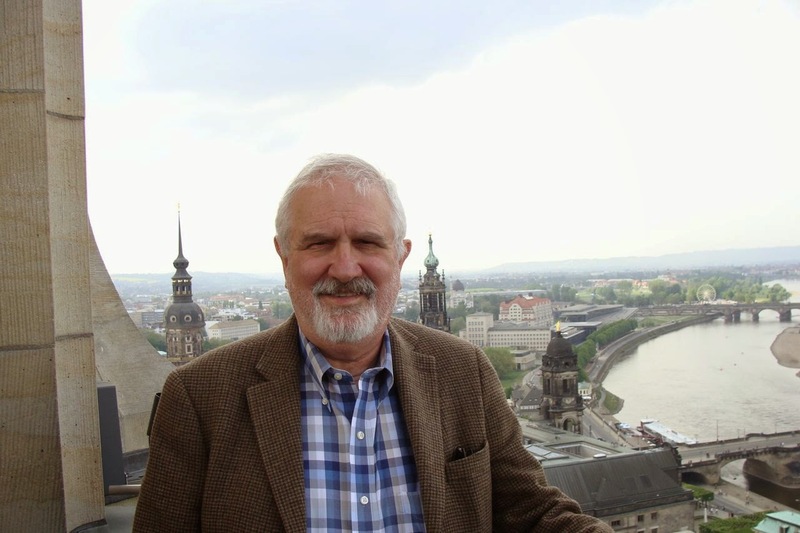 We continue our trek, after stopping for tea and Dresdner Eierschecke (click here for the recipe) and a Donauwelle (click here for the Donauwelle recipe). Both are quite delicious, and I can’t wait to try baking them when I get home. We are heading toward what ought to be a monumental building given the scale of the boulevard, but there is nothing – perhaps there once was. There are two large fountains on either side of the grassy plaza, and the one to the west notes that at one time a memorial for the Red Army was located there – but is there no more. We head east on Bautzner Straße, with the intention of visiting the Dresdner Molkerei Gebrüder Pfund – Der schönste Milchladen der Welt, and it is! People crowd in to look, but very few are buying anything – so I pick up some chocolates. The cheese selection looked wonderful, and I wished I could have purchased some of them. 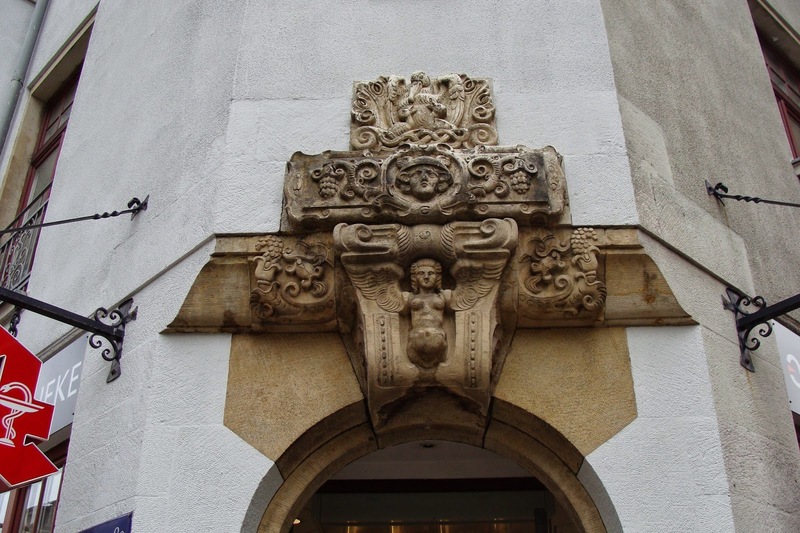 On the way, we also found a wonderful building with some Jugendstil details. There is lunch at a rose garden, in which we explore the German take on Bruschetta and Crostini. Both were good, but an Italian wouldn’t have recognized them. The rose garden is quite long and sits on the edge of the Elbe River. There are many varieties planted along with other plantings. It is quite lovely and made for a relaxing walk. At the Carolabrücke we cross over back to the Altstadt. 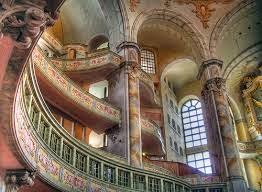 What we head for first is the Synagogue, built across the street from the original building that was burned by the Nazi’s in 1938. It is a striking building, but closed, and curtains don’t allow us to peer inside. On a sidewall, stones note how many Jews were driven out of Dresden, and murdered. It is always sobering. We amble back through the gardens behind the Art Academy, first determining that we want to visit the Albertinum later in the week. 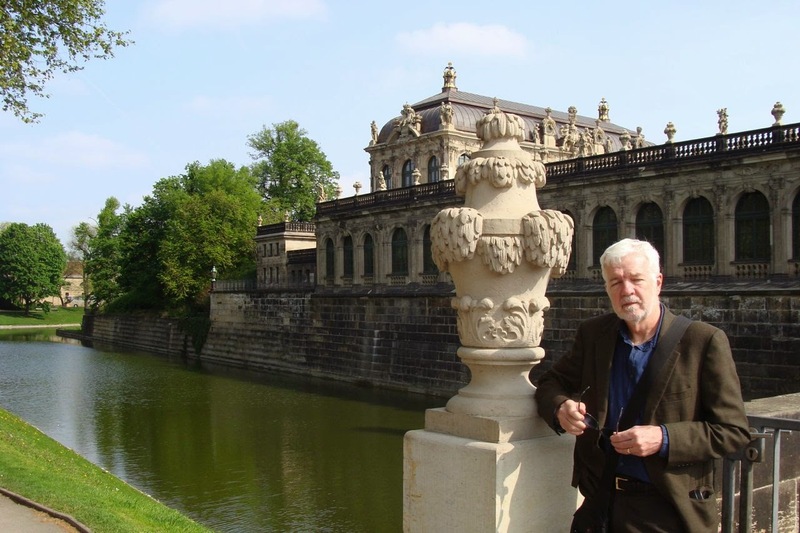 We start the day out by going to the Gemäldergalerie at the Zwinger. It will take up the whole morning. What is interesting to see is how a collection of private individuals, and thus reflecting their taste, is morphed into a national institution under the care and taste of curators. There are some really wonderful works here, and I imagine my sister Wendy salivating over the Dürer Adam and Eve, and several Cranach’s (both older and younger). The big draw is the Raphael, Sistine Madonna, but there are many other delights as well. A surprise to me, there are several Pousin and some very early El Greco. Later in the day, Arthur asks me which moved me the most. 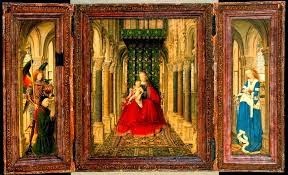 I had to admit that it was the small Van Eyck altarpiece, off in some side gallery. It was jewel-like and quite moving. After lunch and a final tour of the galleries, we make our way to the Hofkirche. 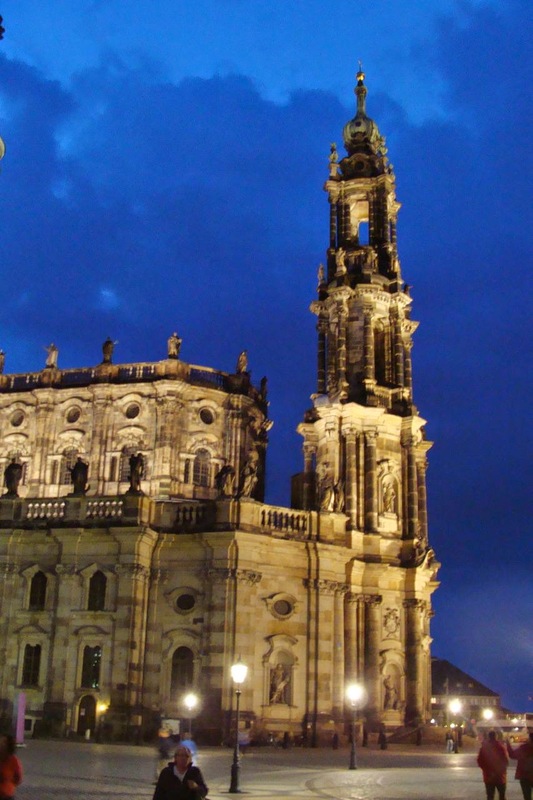 There is a Roman Catholic Cathedral in Dresden because, August the Strong wanted to be the King of Poland – and they required a Catholic ruler – so he converted, and thus the Hofkirche was built. It’s a rather subdued building, but with a magnificent pulpit. It seems, however, that it really doesn’t know what it wants to be. Perhaps it is subdued out of deference to its staunchly Lutheran surroundings. There is one monument that gives me pause. It is a pieta, but so poorly conceived and executed that I couldn’t wait to show it to Arthur (who met it with a wry smile). Perhaps one needs to really tap into the horror of the firebombing – and that is a topic to which we will return soon – in order to appreciate this particular work. If you cannot see it, it is the Blessed Virgin, with the dead Jesus draped across her lap, is holding a crown of thorns. It did make me think. But it seems to reside on the side of the extreme, and not too subtle. 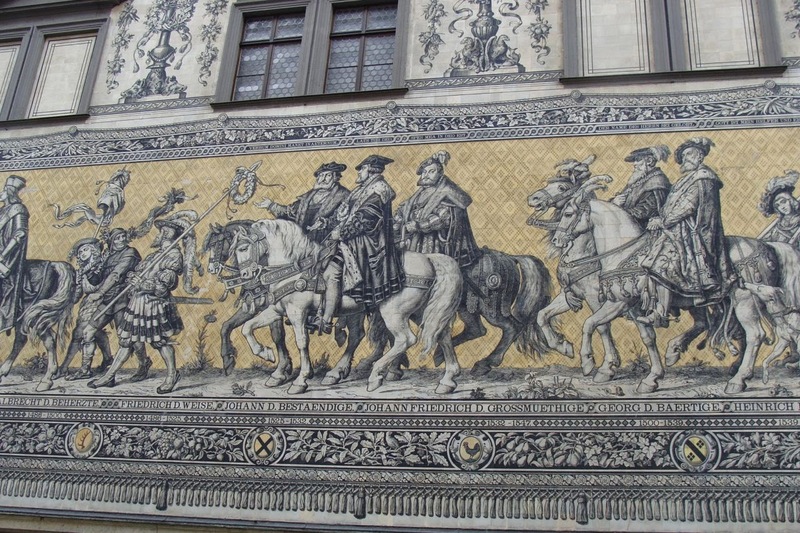 On our way over to the Frauenkirche, we pass by a walk on the side of the Residenz, which depicts all the rulers of Saxonia. It is very interesting. Our first visit to the Frauenkirche was a climb up to the cupola of the church. A combination of stairs and one short elevator ride will get you there. It’s like climbing the Duomo in Florence, but less. 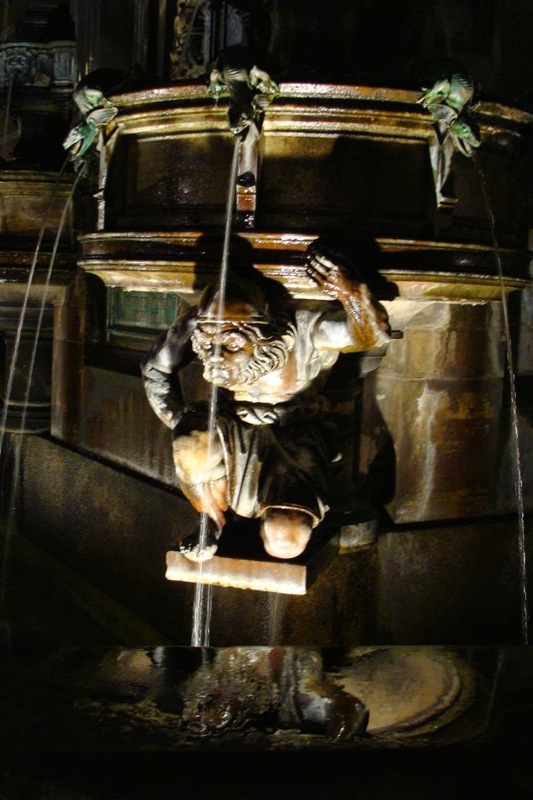 In Florence you get to see the solutions and machinery that Brunelleschi brought to the problem of springing a dome without having any lower supports. Here there are similar engineering problems, but the solutions aren’t as transparent. The views, however, are spectacular. We cannot get into the church proper because of Baptisms, so we walk over to Kreutzkirche. What a contrast! The solution at Frauenkirche was to replace a profile and an interior. The solution at Kreutzkirche was to create a vibrant liturgical space. 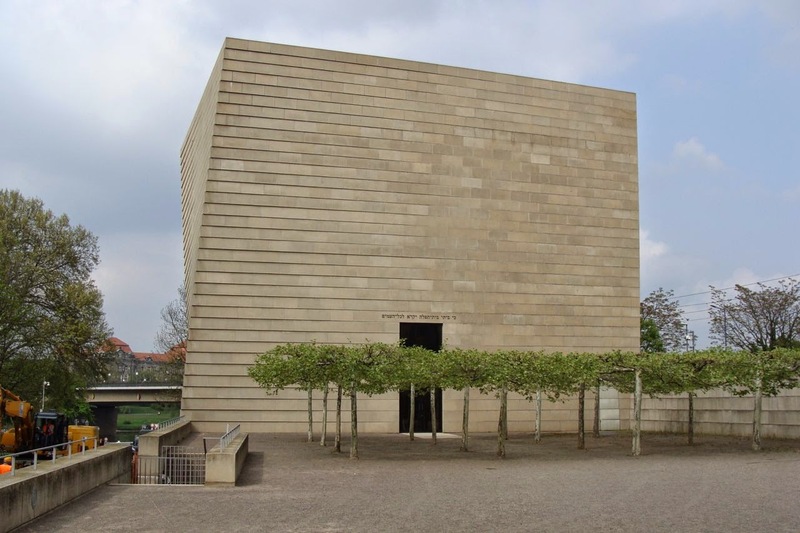 Both spaces are Lutheran (although the commitment at Frauenkirche seems to be nominal – but more about that later) and it is Kreuzkirche that makes both a traditional and a contemporary statement. 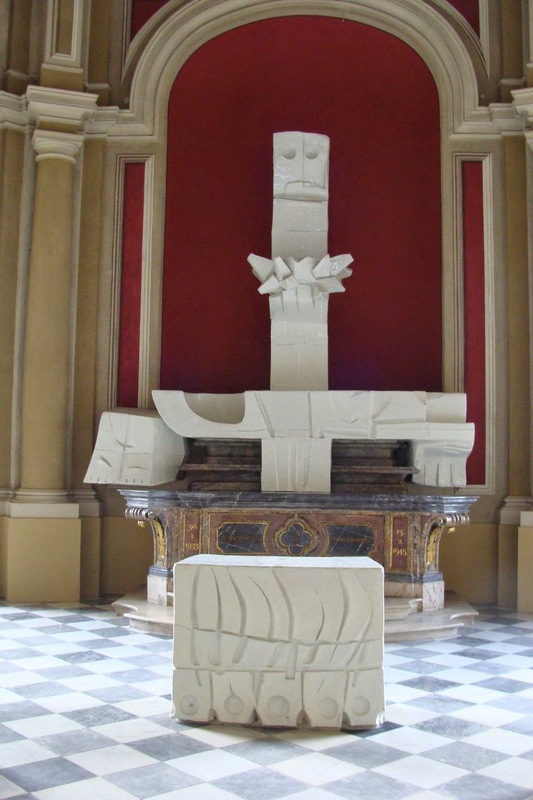 The old altar is reworked, but the remainder of the interior is left empty – an elegant and eloquent statement about the firestorm. 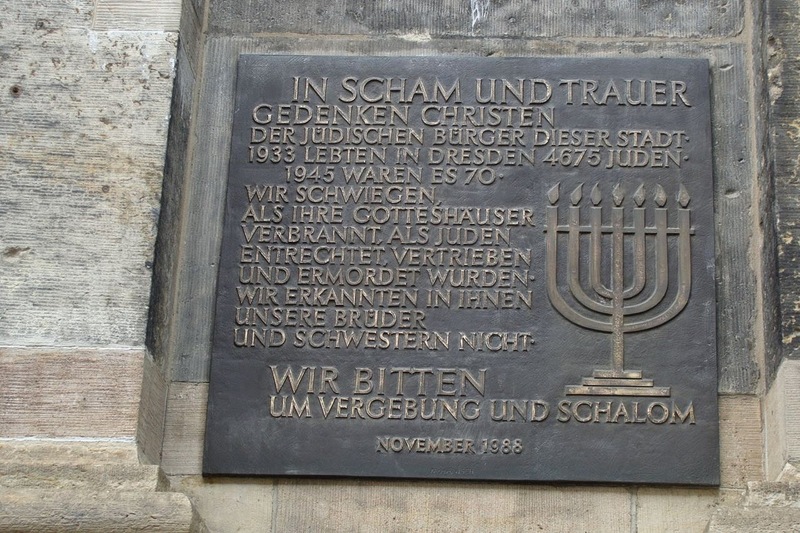 Outside there is an even more convincing piece, and that is a small plaque that acknowledges the treatment of the Jews during National Socialism and the church’s complicity, and that asks for forgiveness. It is stunning, and as we read the sentiments, Arthur and I both weep. We do go to a service (Anglican Evening Prayer) at Frauenkirche. It wasn’t all that satisfying to me. 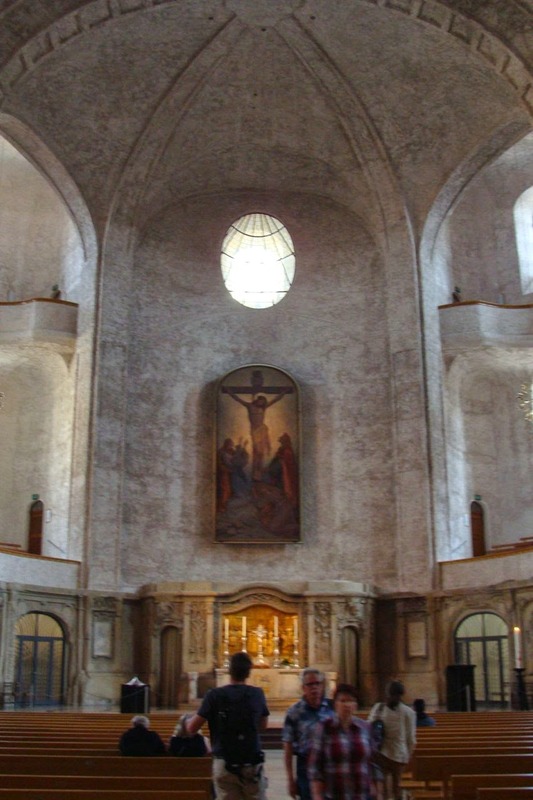 The interior of the church is too new. 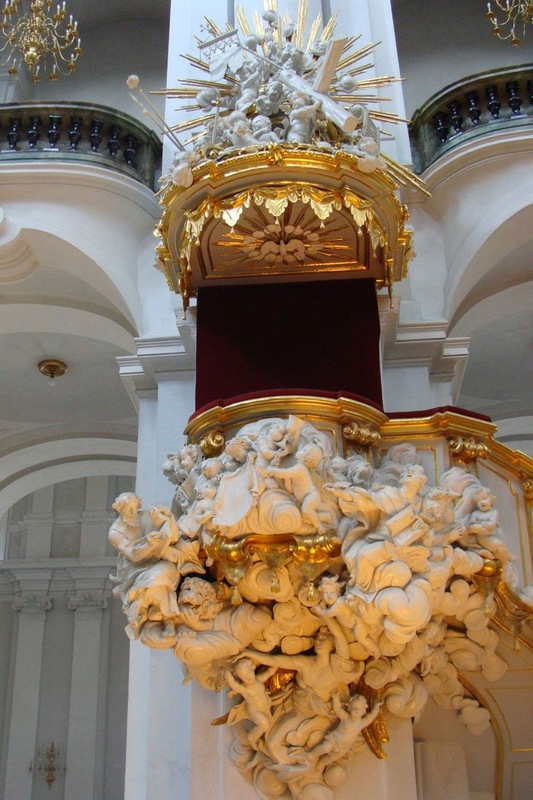 It is going to require a few decades of candle wax and soot to mute the much too bright images and the baroque altar. Here we are in a church, named for Our Lady, and there is no image of her – anywhere. 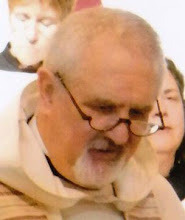 Eucharistic references are nil, and the altar in the lower church has a deep bowl in the mensa of its altar that said to me something was missing. The sentiment at Frauenkirche is that something was taken away and has now been replaced. It doesn’t make, however, any statement about the faith. I had a conversation after the service with a Pfarrarin who was a member of the group that made liturgical decisions about the reconstruction. She was satisfied with what they had done, even though it did not accurately reflect the original designs. The question for me was one of whether there was a duty to just replace the old, or to reinterpret and give some place to the new. I hate to say it, but I think the Frauenkirche is a failure. I don’t think it’s a failure for the Dresdeners, but that success is about civics and not Christianity. We walk back in the twilight, with the buildings taking on a glow against a blue on blue sky. It is lovely. 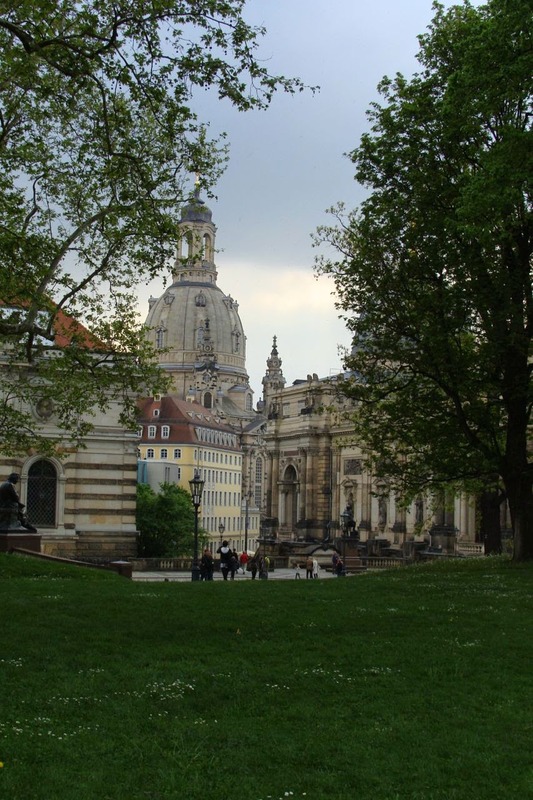 Dresden is a beautiful city that is draped over difficult history. It will take some time to think it through. My train is leaving later than I thought, so I have time to go back into Old Town and do a couple of things. One is to find a gift for Anna, and the other is to get some chocolate for the trip. The first one takes some time, for the places that sell what I’m wanting to be seem to be a bit (shady is not the right word) perhaps not all that trust-worthy. 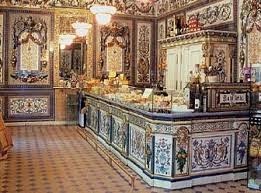 I do find a nice store, however, and then it’s on to chocolate – cherries with alcohol in dark chocolate. 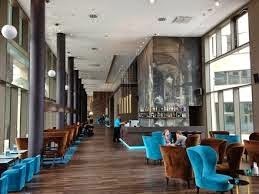 I check out of the hotel, which I actually enjoyed, and then walk a short distance to the train station. A newer station has been built in front of the older station. What has replaced it has all the soul of a mall, and none of the majesty of size or wonder. 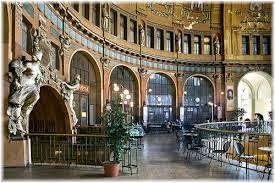 The older station, however, which you can glimpse from the new one running under it, has what you expect from Prague – a bit of exoticism, statuary, size, and surprise. My attention is fixed, in spite of all this delight, on the departure board, for my train is 10 minutes late, and they will not post a platform. Finally, 5 minutes before EC174 pulls into the station, they announce the platform and a swarm of mostly Germans heads, like lemmings to the escalator (only one) that leads to platform 3. A pleasant but insistent man greets me at the door of my car, grabs my baggage and loads it on the car, and now I am obligated to pay him something. I give him all my spare Kc coinage. Our car is quiet. A gay French couple, another Czech couple (straight), and I complete the retinue. So it is a quiet ride, a reverse of what I experienced last Tuesday. 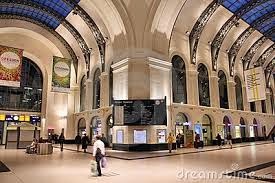 (The French couple do provide a bit of excitement when the police board the train right after the Czech border and demand their passports.) This time, however, the luminous mist, and the fresh green, and the rainbow are all gone. It is now just a matter of getting from here to there. The Dresden Train Station seems cleaner and more inviting than last I saw it. Arthur isn’t there, and there are no text messages from him. So I sit down at a Wiener Feinbacker and have a Himbeer Schnitt (delicious) and a water. Finally a call, Arthur is at the Hotel. Judging from the map it is a short walk – but there I would be wrong. It is several blocks down a zentrum mall – so it is dodging slowly moving people who happen to be shopping. I make navigational errors, and finally by Kreutzkirche, I resort to using a map on my phone, see my error and make it over to our Hotel. And there is Arthur, patiently waiting in the lobby. We check into our room, a little tiny, so Arthur negotiates a larger one. We open the windows, and there is the Shauspielhause with the Zwinger right behind it. Very convenient. We unpack a bit, and then reconnoiter the city, seeing where all the places we wish to visit actually are. There is a delightful building by Schinkel (der Schinkelwache) that has a little restaurant – so we have dinner and catch up. We’re both tired, Arthur having had to make several connections between Schwäbischhall and here. Time for bed.